“Full of surprises. 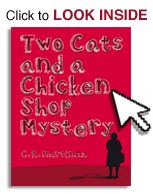 I read ‘Two cats and a chicken shop mystery’ during the holidays, and the book managed to catch my full attention from the very first page! For me, the style of the book is a compelling mixture of Dan Brown and Agatha Christie, where the author succeeds to tie in historical facts with an intriguing story. However, C.R. Martinez brings a kind of humor and wittiness to the story that is rare in mystery novels, while still managing to keep the suspension high until the very last page (no, I’m not exaggerating, you’ll see for yourself when you read the book). The protagonist of the story, Consuelo, takes the reader with her on her quest to solve a mystery, and lets the reader peak into her routines and thoughts. I really enjoyed this story. The title intrigued me; I put in next in my reading lineup. I read the tabby cat part, I have heard a similar story except it was the mark of Mary relating to the cat in the barn where Jesus Christ was born. I have 2 tabbies at present, another reason I was drawn by the title. The story was well told with lots of twists. Will there be a follow up? Thanks a lot for the feedback. I’m glad you enjoyed it! Yes, there might be a follow up, I’m not sure when though. I’ll let you know 😉 Best, c.r.m.